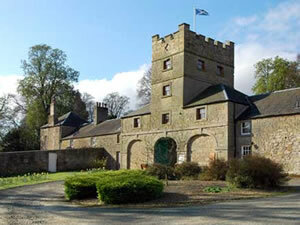 Carriage House in Borders Scotland a perfect base for your holiday in Berwickshire. Find out more about Carriage House below. The building was originally constructed in the late eighteenth century on the outskirts of the Hirsel Estate. The renovation and remodelling of the property seamlessly combines the comfort of modern living with unusual period features such as a library. With parking for up to four cars and capable of sleeping a total of eight people – with one king-size double room, one first floor twin, one second floor twin and one third floor double – this great property would make an excellent holiday home for a single large family, a group of friends, or two smaller families. Carriage House is family friendly self catering. We have the following details listed regarding Carriage House accommodation accessibility but we would recommend that you always confirm these prior to booking with the owner or operator. Carriage House is a great base to explore the wonders of Berwickshire and you will find plenty of activities near by. Carriage House is at Coldstream, Berwickshire TD12 4LF. Check out the map below for directions, use the controls to zoom in. If you have stayed at Carriage House why not add your thoughts, comments, pictures to our Facebook page? Don't forget to add the name/town/page link to your comment so its attributed to the correct place. Please keep it polite, we are sensitive souls! Find Cottage Holidays works closely with independent cottage owners and leading holiday travel operators to provide you the widest choice of self catering accommodation across Scotland. Carriage House in Berwickshire is available through: Sykes Cottages. If you are heading to Berwickshire then check out our guides to local holiday attractions, gardens to visit and county shows to see.